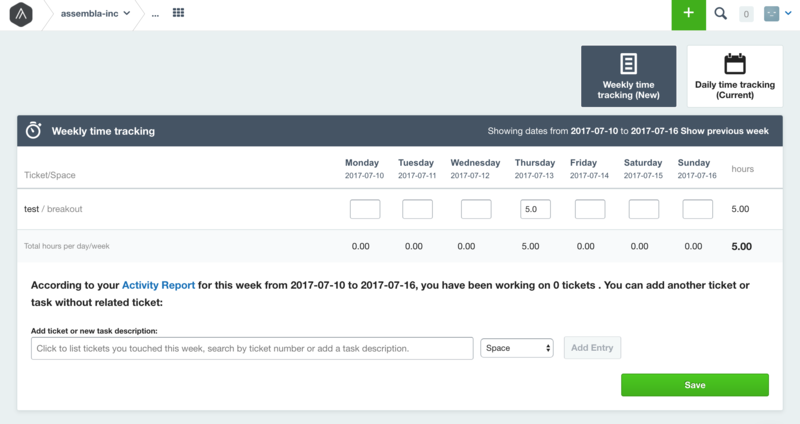 Need to Change the Time Logged on a Ticket? Have you entered the time worked on a ticket incorrectly and now need to change it? Have no fear! Editing your time logs is very simple. To start, navigate to Time from the toolbar at the top of the screen. Then, make sure that you are viewing the time logs for the desired week. The view will default to the current week. Editing time already in the log can be done directly from the text box shown for each day. The time can be typed in or edited using the up and down arrows on the right of the box. Finally, open the ticket to check that the time has been updated accordingly. Additionally, you can use the time tracking tool by clicking Track Time on the start page. The time tracker will show all of the worked hours you have submitted across every space you are a member of. Your time can be shown weekly or daily.